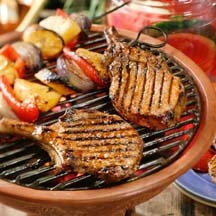 CooksRecipes has quality, kitchen-tested recipes for grilled pork chops that you can count on for successful deliciousness. Pork chops and vegetable kabobs with a tropical flair! 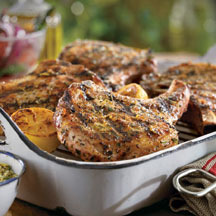 Turn ordinary pork chops into a company-special entrée by using a delicious, easy rub. 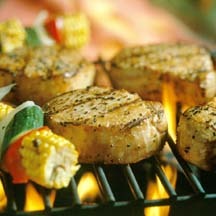 There's almost nothing to compare to the aroma of pork on the grill; and these chops live up to that taste memory.